New Clear Frame Sunglasses with Revo Lenses! - CTS Wholesale LLC. New Clear Frame Sunglasses with Revo Lenses! Here at CTS Wholesale we are super excited to announce the arrival of the much anticipated Clear Frame Sunglasses with Ultra Revo Lenses! 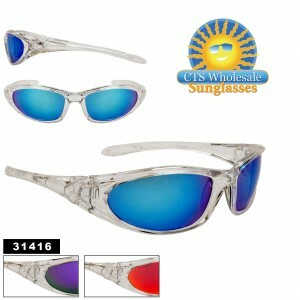 Quite possibly the hottest new style of 2013, these sporty shades will undoubtedly dominate sales this year. 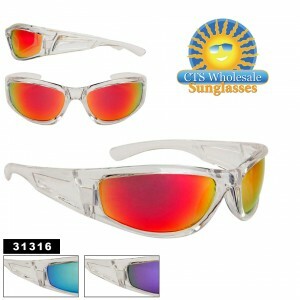 These sunglasses feature a superior Revo coating on the lenses, in 3 vibrant colors. Red/Gold, Purple/Green and Blue revo coatings, that literally shimmers with color intensity. The unique clear frames further enhance this striking look, and the overall appearance is not only superb but also extremely eye-catching. Currently we offer four sports styles of this new style, shown below. You will notice that the styles shown boast an ultra-enhanced lens quality, and you will be pleased to know that they are just as impressive in real life. The revo used is a superior coating that is extremely vibrant. The frames are completely clear as well, without even the slightest color cast or tint. Each dozen will come with an assortment of the available aforementioned revo lens colors, and every pair has clear frames. 31216 is a wrap around sports style, boasting complete coverage for your eyes. The lens shape is somewhat of an inverted trapezoid, with the outer edges slightly tilted upwards, and rounded, with full frames. 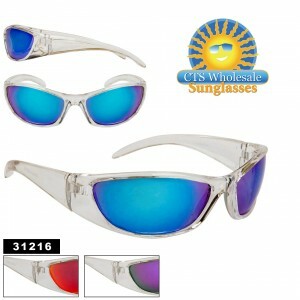 31416is the most curved lens shape of all clear frame sunglasses, being a nice ellipse shape. This model is the slimmest frame, making it very light weight. This style also has an opening in the frame arms, allowing for a neck strap to be attached. All of these new sunglasses also provide 100% UV Protection as well, however in an effort to preserve the Revo Coating, we have not attached the stickers to any of the lenses. And of course, these are the quality you have come to count on from CTS! If you would like to view these products, simply click on the picture!